Spring 2015, North Regional Tournament 2. This was the first club event for the Club Golf of University of Wisconsin-Green Bay. The Founding president David Olson brought together the first competitive team for UWGB. The original six competitors (left to right) Ben Spiering, David Olson, Andrew Hein, Cody Dohrman, Jackson Krauter, and (not pictured) Kyle Lewandowski made the trip to Lawsonia Golf Course. The Golf Club was originally created by students and co-workers Molly Christel and David Olson with the guidance of the club’s academic advisor and General Manager of Shorewood Golf Course, Lee Reinke. The club was intended to unite students on campus with a mutual passion for the game of golf. The concept was simple; create a recreational tournament by joining forces with the intramural program on campus and Shorewood Golf Course for students that attend UWGB. 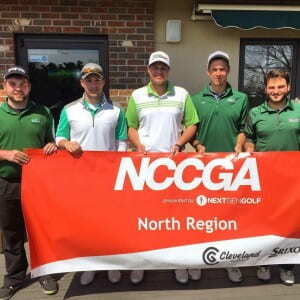 In the process of researching opportunities and in an attempt to expand the reaches of the student organization the student leaders stumbled upon the National Collegiate Club Golf Association or NCCGA. This organization unites intercollegiate non-varsity club golf teams across the country in regional tournaments. The formation of a Golf Club to a Club Golf team above seemingly generated itself overnight and has since lead the direction and growth of the student org.